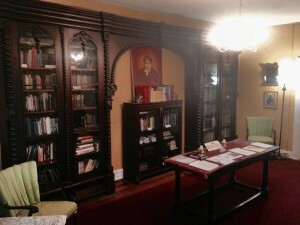 This reference and lending library for members of the Lodge is reportedly the largest esoteric library in Maryland. Over a thousand books and other media (DVDs, VCR tapes) are arranged by subject matter, from Astrology through Zorastrianism, and many subjects in between (Agnihotra, Buddhism, Christianity, Comparative Religion, Consciousness, Divination, Dreams, Gnosticism, Hinduism, Islam, Judaism, Karma, Life after Death, Magic, Mediation, Mysticism, Numerology, Occult Fiction, Philosophy, Plants and Herbs, Prophecy, Reincarnation and Taoism/Confucianism – to name a few). 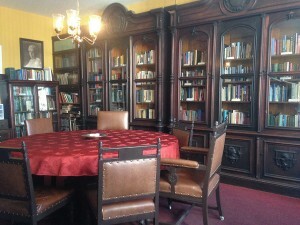 Non-members may browse through the books whenever the Lodge is open, particularly on the first Sunday afternoon of each month, weather-permitting. Brought back in 2015, Library Night is free and open to the public. 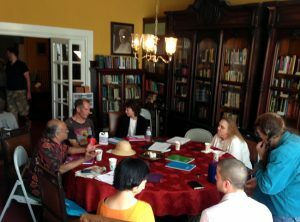 Borrowing privileges are only available to current members of the Theosophical Society, but all are welcomed to browse and read on-site. The conversation is an open exchange on whatever topics come up, so every Wednesday is a different experience. Volunteers are updating the card catalog and putting book information into an electronic database where you could search by topic(s), author and title. The eventual goal is to put the database online at the Lodge’s website.